Before we buy any Porsche or offer to take a SOR (Sale or Return) Porsche, one of our experienced Porsche technicians will first check the car and write a full report. We will then decide if the Porsche is suitable to be sold in our Showroom. Even after our careful selection process, and not being able to predict the future, something may still fail after a few weeks or months. 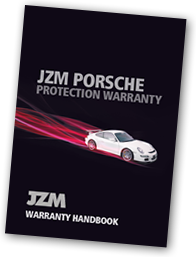 To ensure you have complete peace of mind when buying your Porsche from JZM Porsche Sales we offer a FREE 12 Month or 12,000 Mile Warranty. Our JZM Porsche Warranty options have been carefully tailored to ensure we meet your needs and offer you complete confidence when purchasing your prized possession.